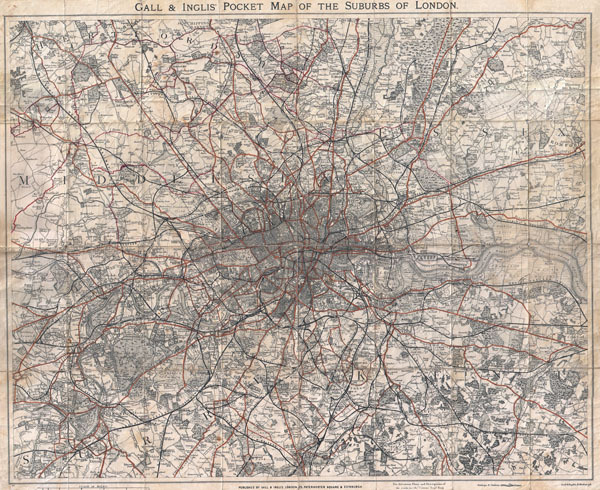 Gall & Inglis' Pocket Map of the Suburbs of London. This is an attractive map of London, England, and its suburbs by Gall and Inglis. Dates to around the turn of the century (1900). Map offers considerable, even to the level of individual buildings. Labels important towns, stations, parks, and buildings. Cycling routes are laid out in hand applied color. Published by Gall and Inglis from their London office at 25 Paternoster Square. Gall and Inglis' (1810 - 1960) were Edinburgh based publishers. The firm was founded c. 1810 by James Gall. Gall went through a series of partnerships with other publishers including Turnbull, Hay, and finally Robert Inglis. Their publishing work consisted of novels, textbooks, guide, and essays as well as maps. They were also ordinance survey publishers. Very good condition. Mounted on original linen. Minor along original fold lines.